A natural heart has two pumps, each with two chambers. The right atrium pumps oxygen-depleted blood from the body into the right ventricle, which pumps it to the lungs. The left atrium sends aerated blood from the lungs into the left ventricle, which pumps it out to the body. With each heart beat, the two atria contract together, followed by the large ventricles. Congestive heart failure, which is the steadily declining ability of the heart to pump blood, is one of the leading causes of death. This disease is caused by sudden damage from heart attacks, deterioration from viral infections, valve malfunctions, high blood pressure and other problems. According to the American Heart Association, an estimated five million Americans are living with heart failure and over 400,000 new cases are diagnosed every year. About 50% of all patients die within five years. Heart disease cost the United States health industry about $95 billion in 1998. Though medication and surgical techniques can help control symptoms, the only cure for heart failure is an organ transplant. In 1998, around 7,700 Americans were on the national heart transplant list but only 30% received transplants. Artificial hearts and pump-assist devices have thus been developed as potential alternatives. An artificial heart maintains the heart's blood circulation and oxygenation for varying periods of time. The ideal artificial heart must beat 100,000 times every 24 hours without requiring either lubrication nor maintenance and must have a constant power source. It must also pump faster or slower depending on the activity of the patient without causing either infection or blood clots. 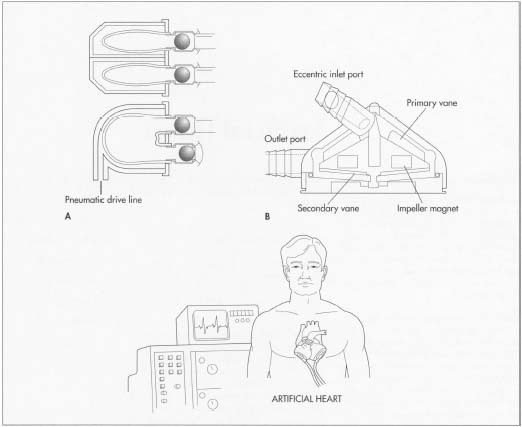 The two major types of artificial hearts are the heart-lung machine and the mechanical heart. The first type consists of an oxygenator and a pump and is mainly used to keep blood flowing while the heart is operated on. This machine can only operate for a few hours since the blood becomes damaged after longer times. A mechanical heart is designed to reduce the total work load of a heart that can no longer work at its normal capacity. These hearts consist of equipment that pulses the blood between heart beats or use an artificial auxiliary ventricle (left ventricle assist device, LVAD) that pumps a portion of the normal cardiac output. Because such devices usually result in complications to the patient, they have generally been used as a temporary replacement until natural hearts can be obtained for transplantation. Worldwide about 4,000 LVADs have been implanted. The market for these devices is estimated at $12 billion per year in the United States. A. A pneumatic artificial heart. B. A gyro centrifugal artificial heart. established the artificial heart program in 1964, leading to the first total artificial heart for human use implanted in 1969. 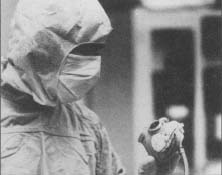 The emphasis shifted to left ventricular assist systems and blood compatible materials in 1970. During that same year, a LVAD was used successfully. However, blood pump development continued and devices became smaller, lighter, more acceptable, and clinically successful. A number of polyurethane and plastic pumps of longlife time were also developed. During the 1980s, the Food and Drug Administration (FDA) imposed more restrictive rules to the Medical Devices Standards Act, leading to higher development costs. Many research groups had to drop out, with only a few remaining today. Perhaps the most famous scientist is Dr. Robert Jarvik, who invented an artificial heart called the Jarvik-7. This device, made from aluminum and plastic, replaced the two lower chambers of the natural heart and used two rubber diaphragms for the pumping action. An external compressor the size of a refrigerator kept the artificial heart beating. Barney Clark was the first patient to receive this heart. He survived 112 days before physical complications caused by the implant took his life. In 1986, William Schroeder became the second Jarvik-7 recipient, surviving for about 20 months. The medical community realized that a completely implantable heart could avoid the mobility and infection problems caused by the Jarvik-7. In 1988, the National Institutes of Health began funding development of such hearts and was supporting such a program in 1991 totaling $6 million. Three years later, an electric and battery-powered implantable LVAD became available. In 1999, Charlie Chappis became the first patient ever released from a hospital with such a device. Other artificial hearts of various designs are currently being tested. An artificial heart or LVAD is made out of metal, plastic, ceramic, and animal parts. A titanium-aluminum-vanadium alloy is used for the pump and other metal parts because it is biocompatible and has suitable structural properties. The titanium parts are cast at a specialized titanium processor. Except for blood-contacting surfaces, the titanium is machined to a specific finish. Blood-contacting surfaces receive a special coating of titanium microspheres that bond permanently to the surface. With this coating, blood cells adhere to the surface, creating a living lining. A blood-contacting diaphragm within the pump is made from a special type of polyurethane that is also textured to provide blood cell adherence. Two tubular grafts are made from polyester (which are used to attach the device to the aorta) and the valves are actual heart valves removed from a pig. Other parts that make up the motor are made from titanium or other metals and ceramics. There are several critical issues when designing a LVAD. Fluid dynamics of the blood flow must be understood so that enough blood is pumped and no blood clots are created. Materials must be chosen that are biocompatible; otherwise the pump could fail. The efficiency of the motor must be optimized so that minimal heat is generated. Because of possible rejection, the total volume and surface area of the entire device should be kept as small as possible. A typical LVAD weighs around 2.4 lb (1,200 gm) and has a volume of 1.4 pints (660 ml). Robert Jarvik was born on May 11, 1946, in Midland, Michigan, and raised in Stamford, Connecticut. He entered New York's Syracuse University in 1964, studying architecture and mechanical drawing. After his father developed heart disease, Jarvik switched to pre-medicine. He graduated in 1968 with a bachelor of arts in zoology, but was rejected by medical schools in the United States. He entered the University of Bologna in Italy, but left in 1971 for New York University, earning a master of arts in occupational biomechanics. Jarvik applied for a job at the University of Utah. The director of the Institute for Biomedical Engineering and Division of Artificial Organs, Willem Kolff, had been developing an artificial heart since the mid-1950s. Jarvik began as his lab assistant, earning his medical degree in 1976. On December 2, 1982, doctors transplanted the first artificial heart into a human. This plastic and aluminum device, the Jarvik-7, was implanted into Barney Clark, who survived for 112 days after the operation. Several other patients received Jarvik-7 hearts but none lived more than 620 days. The main benefits were that there wouldn't be a wait for a human heart and there was no chance of rejection. The obvious pitfall being patients were forever connected to a compressed air machine via tubes. The Jarvik-7 was eventually used as a stopgap measure for patients awaiting natural hearts and provided hope that there would not be a wait for transplants. In 1998 Jarvik continued work on a self-contained device to be implanted into a person's diseased heart to make it function correctly. 1 Most of the components are made to custom specifications by third party manufacturers, including machine shops and printed circuit board manufacturers. The porcine valves are sewn inside the grafts with sutures at a medical device firm that specializes in heart valves. Once all components are obtained, the LVAD system is assembled and tested, to ensure that each device meets all specifications. Once tested, the LVAD can be sterilized and packaged for shipment. 2 Some artificial heart manufacturers make their own polyurethane parts. One process uses a proprietary liquid solution that is poured on a ceramic mandrel layer by layer. Each layer is heated and dried until the desired thickness is reached. The part is then removed from the mandrel and inspected. Otherwise, a third party manufacturer uses an injection molding or vacuum molding process combined with radio frequency welding. 3 Each artificial heart takes several days to put together and test. The assembly process is performed in a clean room to avoid contamination. Each artificial heart consists of up to 50 components that are put together using special adhesives. These adhesives require curing at high temperatures. Several assembly operations happen in parallel, including the assembly of the motor housing and components, the assembly of the percutaneous tube and the attachment of the pusher plates to the polyurethane diaphragm. These subsystems are individually inspected, then final assembly of the complete system occurs. The grafts are assembled separately and attached during operation. 4 After assembly is completed, each device is tested using special equipment that simulates pressures in the body. All electronic components are tested with electronic test equipment to ensure the proper function of all circuitry. 5 After the artificial heart is tested and passes, it is sent to an outside service for sterilization. Each device is sealed in plastic trays and returned to the heart manufacturer. It is then packaged in custom suitcases to protect it from contamination and prevent damage. Most components have already passed inspection before they arrive at the heart manufacturer. Some components are still inspected dimensionally since they require tight tolerances—on the order of millionths of an inch, which requires special measuring tools. To meet FDA regulations, every component (including adhesives) used in the process is controlled by lot and serial number so that tracking problems is possible. Scrap titanium is recovered and recycled after remelting and recasting. Otherwise, little waste is produced since most components have passed inspection before leaving the various manufacturers. Other defective parts are discarded. Once a device has been used by a patient, it is sent back to the heart manufacturer for analysis to improve the design. Within the next decade, a number of new devices will come on the market. Pennsylvania State University researchers are developing an electromechanical heart powered by radio-frequency energy that is transmitted through the skin. A motor drives push plates, which alternate in pressing against plastic blood-filled sacs to simulate pumping. Patients carry a battery pack during the day and sleep with the device plugged in to an electrical outlet. This artificial heart will be tested in humans by 2001. Several research groups are developing pumps that circulate blood continuously, rather than using a pumping action, since these pumps are smaller and more efficient. In Australia, Micromedical Industries Limited is developing a continuous-flow rotary blood pump, which is expected to be implanted in a human by 2001. The Ohio State University's cardiology department is developing a plastic pump the size of a hockey puck that is self regulating. This pump is implanted in patients for several weeks until their own heart recovers. Thermo Cardiosystems, Inc. is also working on a LVAD with a continuous flow rotary pump), expected to be implanted sometime in 2000, and a LVAD with a continuous flow centrifugal pump. The latter is still in an early development phase, but is planned to be the world's first bearingless pump, meaning that it won't have any parts that wear. This is accomplished by magnetically suspending the rotor of the pump. Both these devices will be available with transcutaneous energy transfer, meaning that the devices will be fully implantable. With fewer donor hearts becoming available, others are also developing an artificial heart that is a permanent replacement. These replacements may be in the form of a left ventricle assist device or a total artificial heart, depending on the patient's physical condition. LVADs are being developed by inventor Robert Jarvik and renowned heart surgeon Michael DeBakey. Total artificial hearts are being jointly developed by the Texas Heart Institute and Abiomed, Inc. in Massachusetts. In Japan, researchers are developing total artificial hearts based on a silicone ball valve system and a centrifugal pump with a bearing system made from alumina ceramic and polyethylene components. Alternatives to artificial hearts and heart-assist pumps are also under development. For instance, a special clamp has been invented that changes the shape of a diseased heart, which is expected to improve the pumping efficiency by up to 30%. Such a device requires minimal invasive surgery to implant. Bonfield, Tim. "Device to Help Hearts." Cincinnati Enquirer (November 7, 1999). Castor, Tasha. "Ohio State University Cardiology Unit Set to Try Heart Pump." The Lantern (May 6, 1999). "Electric Hearts by 2005." Popular Mechanics (March 1997). Gugliotta, Guy. "Upbeat on Man-Made Hearts: Improved Devices Save Those Too III for Transplant." The Washington Post (June 28, 1999): AOl. Guy, T. Sloane. "Evolution and Current Status of the Total Artificial Heart: The Search Continues." ASAIO Journal (January-February 1998): 28-33. Hall, Celia. "Thumb-Sized Pump Can Cut Heart Deaths." The Daily Telegraph (September 13, 1999): 11. Hesman, Tina. "Pump Brings New Expectations for Artificial Heart." Omaha World-Herald (December 12, 1999). Hopkins, Elaine. "Device Lets Heart Patient Await Transplant at Home." Journal Star (November 30, 1999). Kinney, David. "Effective Artificial Heart Seems Within Reach." The Los Angeles Times (January 23, 2000). Kolff, William. "Early Years of Artificial Organs at the Cleveland Clinic: Part II: Open Heart Surgery and Artificial Hearts." ASAIO Journal (May-June 1998): 123-128. Kolff, William. "The Need for Easier Manufacturing of Artificial Hearts and Assist Devices and How This Need Can Be Met by the Vacuum Molding Technique." ASAIO Journal (January-February 1998): 12-27. Kunzig, Robert. "The Beat Goes On." Discover (January 2000): 33-34. M2 Communications. "Successful Blood Compatibility Tests for Micromedical's Artificial Heart." M2 PressWIRE (March 26, 1999). Phillips, Winfred. "The Artificial Heart: History and Current Status." Journal of Biomechanical Engineering (November 1993): 555-557. Takami, Y. et al. "Current Progress in the Development of a Totally Implantable Gyro Centrifugal Artificial Heart." ASAIO Journal (May-June 1998): 207-211. Wilson, Steve. "A Life and Death Race Against Time. " Arizona Republic (November 14, 1999). Yambe, T. et al. "Development of Total Artificial Heart with Economical and Durability Advantages." The International Journal of Artificial Organs (1998): 279-284. "Progress on Development of an Artificial Heart." http://www.uts.edu.au/new/archives/l999/February/02.html (December 29,2000). this article is very much useful for getting knowledge about heart and how to make artificial. heart.